Mystery press, anyone know this one? 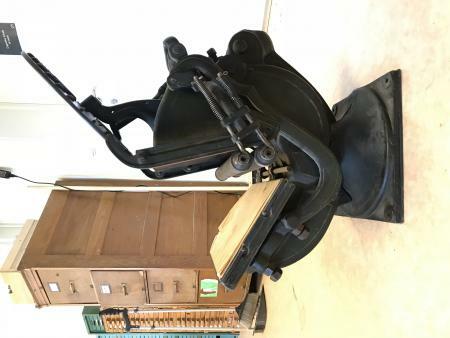 Do anyone know what type of press this is? I do miss the arm and a form for this press. 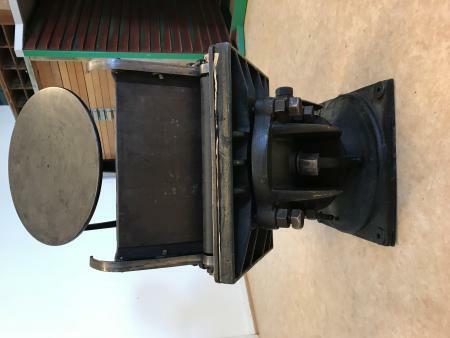 If I can identify the press, maybe I can get the parts for it? I would say it is a Golding Official, made by Wm. Golding Co. of Boston, or a close copy. Sigwalt Co. of Chicago made a close copy that I have one of, called Nonpareil, with a round base like this, and their later similar model had a square base. However, a difference appears to be that the roller rails on the bed, at the top, are thinner and more curved on this press, and it appears that the roller rails may be screwed to the bed rather than cast as one piece as on the Golding and Sigwalt. If you are European, there were some companies there that made copies of the Official with some changes, so perhaps you have one of those. They are excellent presses and do fine work. The press is located in Norway. You might have to make them, or have them made for you. The chase on the Golding was held in the bed by a spring-loaded clamp at the top. On the Sigwalt the chase is held in the bed by two steel pins, one on each side, behind which small wedges on the chase slide and catch as the chase is lowered into position. If you can tell how the chase was held in your press you can get a chase made by a careful machinist/welder. The handle can also be made by the same person, using a straight piece of pipe with a shovel handle attached at one end and the other end welded to a piece of metal bored to fit on the shaft and fitted with strong set screws. I doubt that you will find any such replacement parts for an old unusual press like that. My guess is that it is a European press based on the Official design. See page 16 of the Golding 1881 catalogue. Just out of curiosity, where in Norway are you? Yes, we have thought of that. There are a number of Golding experts here in the US that know a great deal about him and his designs. Golding was a premier US manufacturer with a great deal of evidence of his designs being copied both here in the US (Sigwalt) and in Europe by numerous manufacturers. There are extensive patent documents and easily dated records and ads. There has been no evidence presented by anyone showing the reverse for Golding designed presses. That said, I am open to new info if you have something. I have an original lever from a #5 Ideal (Sigwalt) 6 X 9. Measure your lever shaft and we will see if it will fit. I’ve been looking around trough the European copies (It seems to me like its copies and not the other way around, but that is an hole new discussion, and I will not go there ;) ) I found the Hogenforst, but I can’t seem to find the perfect match. We are located in a small town, Close to Lillehammer, approximately 2 hours drive from Oslo. I work at the Norwegian trade union college/folk higschool. We are getting together a workshop for our students. We recently inherit two presses from Oslo graphic union, one Golding pearl #3 and this little mistery. And Tom, I will measure and send you an e-mail. Maybe it could be a match? @Thomas Gravemaker, do you know of any European manufacturers that I can check out? Marit, check out the museums in Leipzig and Hamburg (Germany). And, Jens Jørgen Hansen (Denmark) is the man to get in touch with in Scandinavia, he’s got an extensive knowledge of printing presses and a lot of documentation of European manufacturers. There were dozens of press builders in Germany who sold their machines through either agents or type foundries who served as their agents. Many of these machines don’t bear any manufacturers names, but often had plates of the agents/type foundries attached to them. Here in the Netherlands, both the Amsterdam type foundry and the Enschedé type foundry sold equipment built in Germany, Krause, Heidelberg, Hogenforst, Korrex and Eickhoff are just a few names. I think this press is a European knock off the American Golding Official. I have found this illustration from 1892 showing Rich. 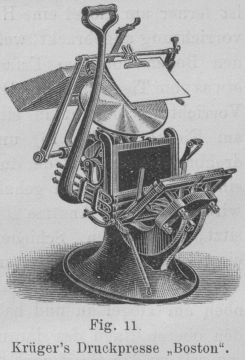 O. Krüger’s “Boston Presse”. Regarding the missing handle and chase etc. 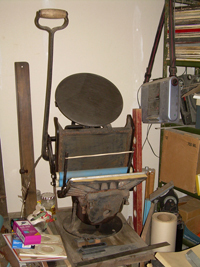 It is relative hard to find spare parts for presses like these – maybe another “broken” press can be donor – but Krüger presses are rare. If a table top is wished I would go for another one – a common Hogenforst etc. It is relative easy to find good table tops here in the Nordic countries – that’s the way I would go. Here a link to the 1892 illustration. That may or may not be the same maker - definitely not the same model. Because the “Boston tiegel” is such a good design, I would suggest making simple substitute parts (it seems maybe only the handle and chase, and maybe roller “trucks” or “runners”, plus rollers you need new anyway, are needed to make it print). Then you can use it to print while you are searching for correct replacement parts. Authentic appearance may not be an issue if it is not for museum display. Thank you everybody! I will look in to all of your good suggestions. Some of them is already checked out, but no match so far. I will inform you if I find a match.